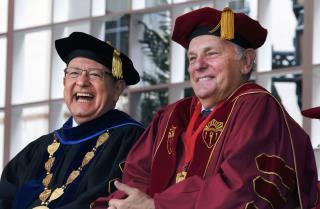 (Newser) – Outrage is growing at the University of Southern California, where 200 faculty members on Tuesday called for the university's president, CL Max Nikias, to step down over the university's handling of sexual abuse allegations against a former campus health clinic gynecologist. At least eight complaints were made against Dr. George Tyndall between 2000 and 2014, but they weren't brought to light until an internal USC probe in 2016, launched after a health center staff member complained about Tyndall, found he had sexually harassed patients. But the private university didn't report him to the state medical board, instead simply allowing Tyndall to resign last year, Reuters reports. More allegations have sprung up recently, including several lawsuits filed by former patients, a new accusation dating back to 1991, and hundreds of reports from concerned patients who responded to a hotline and special website set up by USC. Jury in Georgia just awarded a billion dollars to a girl raped when she was 14 by a security guard at the party she attended. She won't see much, if any, of that amount, but USC certainly has the money. Shut the university down, go for the trillions. No doubt they covered up their sins. When it comes to a woman's body, she should see a female doc. It has been a hidden truth until now some guys go into gyno because of what we're reading about. Perversity among the male gyno doc's. This will be a tricky problem for tiny conservative minds: Who do they hate more? Universities or women who complain of sexual assault.